HOME TO BOTH UPPER-DIVISION AND FIRST-YEAR RESIDENTS AS SPACE ALLOWS AND OCCUPANCY DICTATES. 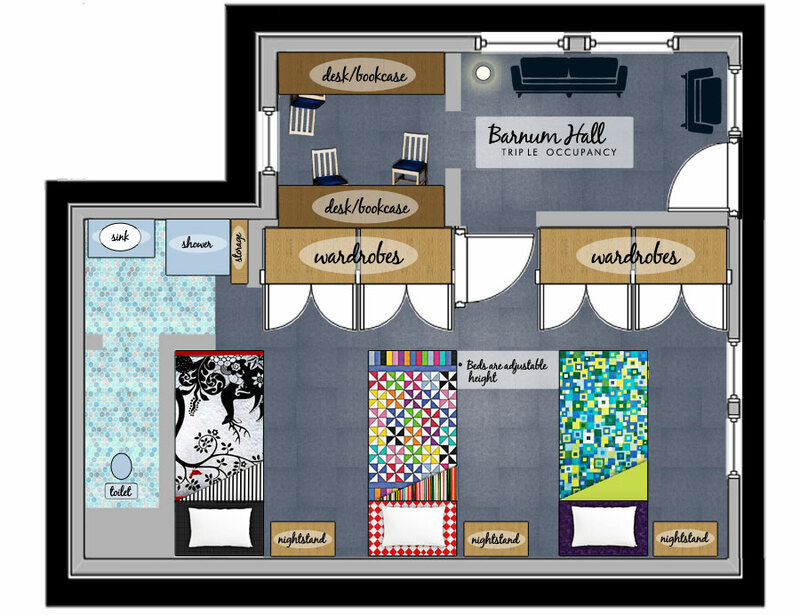 BARNUM IS A SUITE-STYLE HALL TUCKED IN ON THE NORTHWEST SIDE OF VALSETZ DINING HALL. BARNUM LIES IS IN THE HEART OF THE RESIDENTIAL COMPLEX, AND OFFERS GENEROUS LIVING SPACE WITHIN ITS’ SUITE STYLE ROOMS AND PROVIDES COMFORTABLE LIVING SPACE FOR UP TO 99 RESIDENTS AND 3 LIVE-IN RESIDENT ASSISTANTS. 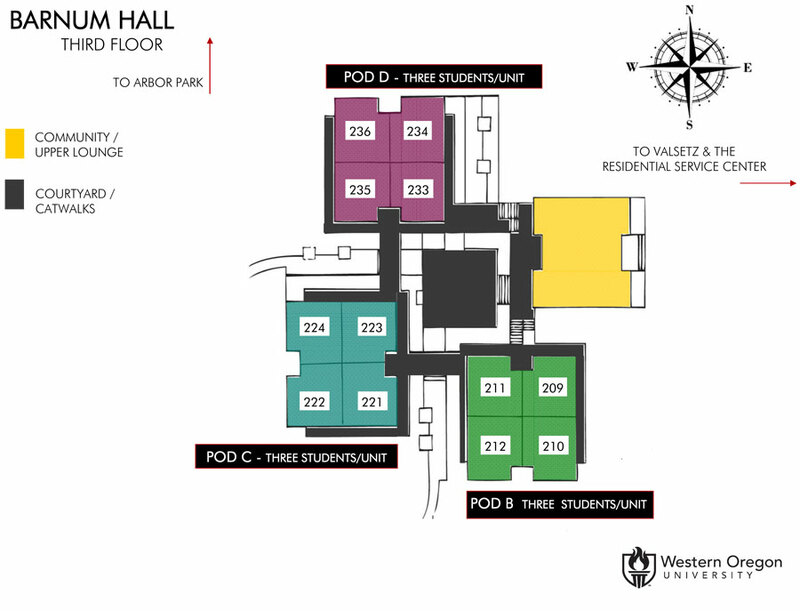 3 Pods with 12 suites on each floor accessed from exterior entrances. The suites in Barnum are generally triples (3 residents per suite) and offer approximately 300 square feet of living space with separate sleeping quarters and a bathroom in every unit. A 4th pod houses lounges, laundry and common space. 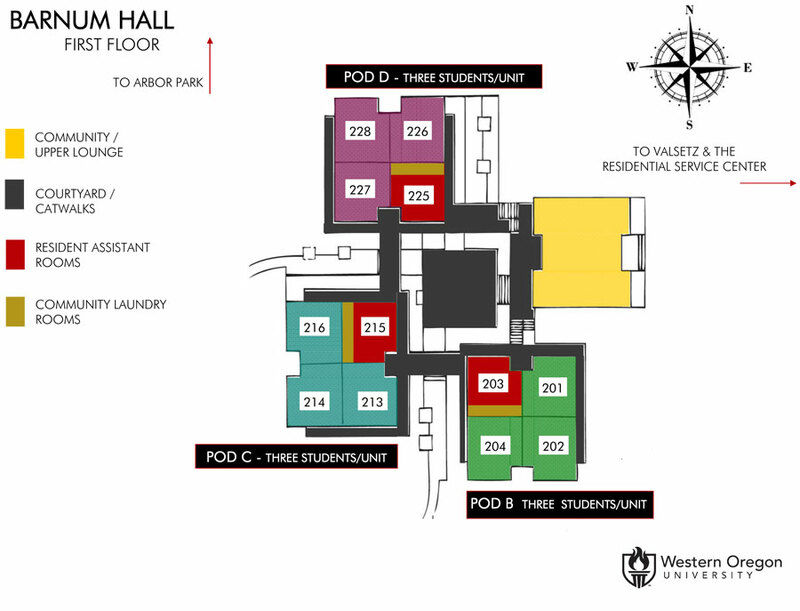 Barnum enjoys easy, close and covered access to the Valsetz Dining Hall and the Residential Service Center. Hamersly Library, the Student Health Center and the Richard Woodcock Education Center are about a block away. The Health and Wellness Center and the main body of campus are just minutes away – well within walking distance. There is an additional cost to stay in this hall during Winter and Spring break. See your Residential Contract for details. Each suite has a bathroom with one shower, sink and toilet accessed off of the sleeping area. There is also one gender-neutral restroom located within the ground floor lobby. Rooms are carpeted. There is a common space/lounge with TV (cable) and games. Barnum residents also benefit from study rooms, free laundry for residents within the facility, high speed wireless internet and tech support. Barnum residents have access to the community kitchen in Landers Hall. All residential students have the opportunity to stream movies to the device of their choice via Res-Life Cinema!